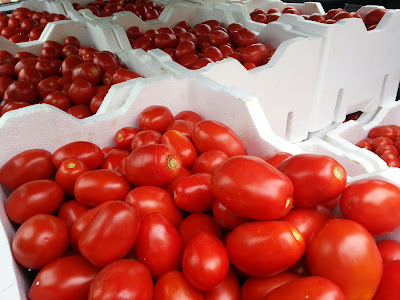 This time of year is “tomato season” and it’s an Italian tradition of ours to spend a weekend together and make enough tomato sauce to last us the year. Of course, everyone does this differently, but here I’ll outline how our family does it. If you go to any suburbs that have an Italian community you’ll most probably see signs for people selling “sauce tomatoes”. Sauce tomatoes are normally more ripe than usual, which makes them ideal to turn into sauce. 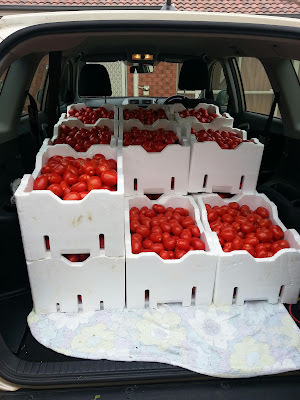 We bought 16 boxes of tomatoes from the local Italian social club. This part is where most of the effort is spent! 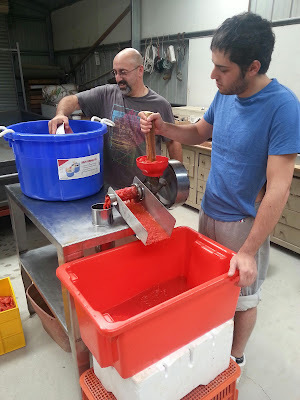 We use large plastic tubs, fill them with two thirds water and empty some tomatoes in. 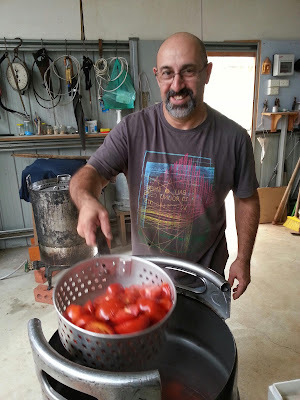 We then pull out a tomato one by one, cut it in half and then cut the hard stem out from the middle, putting all the stems in the compost bin and the washed, cut tomatoes in another bucket. This makes it easier to mince later, but also gives us a chance to inspect the tomato to ensure the inside isn’t rotten. Rotten tomatoes are easy to spot, they are either black on the inside or they stink! If ever you’re not sure, giving it a smell is normally the easiest way to tell - and “When in doubt, throw it out”. “Sauce tomatoes” are normally very ripe and soft, but sometimes they are quite firm. If this is the case they won’t go through the mincer as well. So to help with this, we used a couple of large drums filled with water on a flame to lightly boil them a little. The idea is to only soften them up, so once the skin starts peeling off, you can pull them out of the water and drain them to remove as much as the water as possible (otherwise the sauce will be watery). 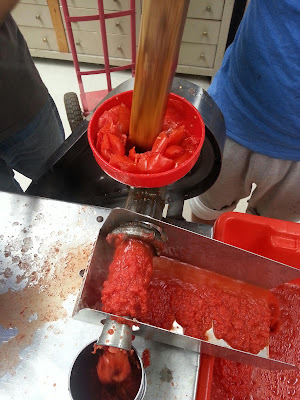 Now that the tomatoes are soft, washed and cut they can be minced. 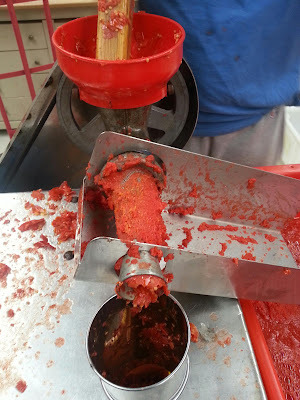 We scoop out some tomatoes and put them in the mincer. 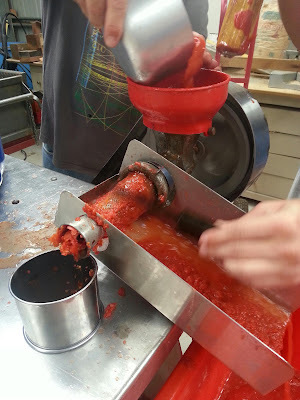 The mincer will separate the tomato sauce from the skin and the seeds. We generally fill one tub at a time. Once you have a (mostly) full tub of sauce, we actually put the left over skin and seed back through one more time and mix it with the rest of the sauce in the tub. 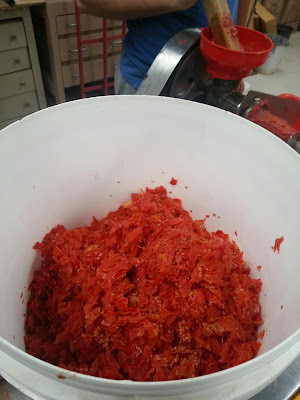 This produces a thicker consistency and really gets the most out of the tomatoes. Be sure to mix the tub up well, otherwise the consistency will not be evenly spread. 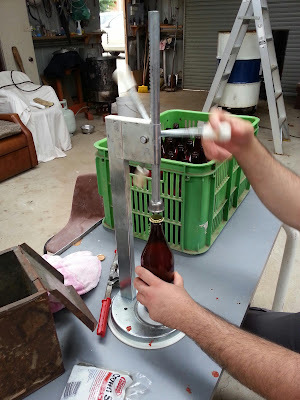 This year we used three different types of bottles: The usual large beer bottles with bottle caps, large jars with screw on lids and for the first time we tried using a few small (crown lager) beer bottles. 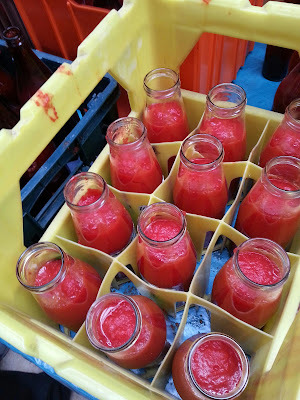 The first step is to put a spoon of salt and two basil leaves in each bottle, then fill the bottles with the sauce, leaving at least 5cm of an air gap from the top of the bottle. Throughout the year, we collect up the beer bottles so we can re-use them for the next year. Be careful of this though, the bottles shouldn’t be reused for more than about three times or so. Every time they are boiled, the bottles get weaker, so if they are reused too many times, they will eventually shatter when they are boiled. The jars with the screw on lids are the most risky. They need to be sealed tightly, otherwise they will not preserve correctly and will make a mess in the final stages. The beer bottles on the other hand are more reliable. You can buy bags of new bottle caps fairly cheaply and then using a “capper”, they normally seal quite well. Just be sure to check they are tight as you go. 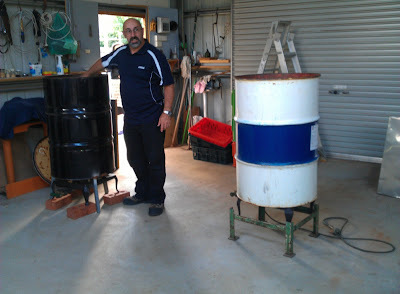 After the sauce bottles are all sealed and ready to go, they are gently placed in a drum where they are boiled. 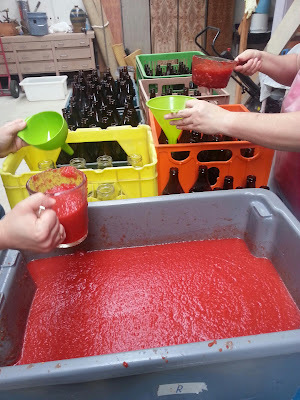 We generally put a blanket in the bottom of the barrel, then a layer of bottles standing upright, then another blanket, another layer of bottles, etc. Then fill the drum with water and turn the flame on. As this is a large volume to heat up, it takes quite a while to start to boil, but once the boiling and/or steaming has started, we keep the flame on for another two hours. It’s very important that once they have boiled for two hours that you leave them in the water until the water goes cold - this could be a whole day. 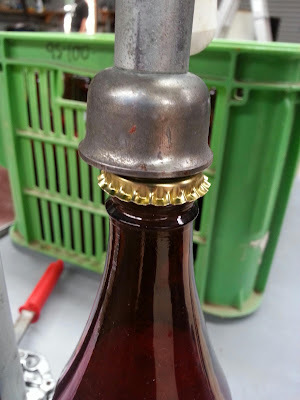 Taking them out too early can cause the bottles to shatter. 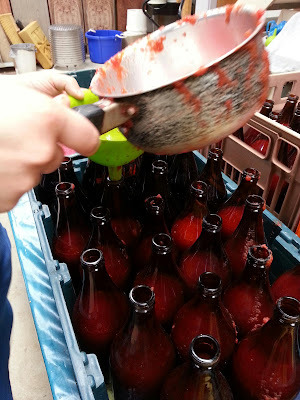 This process is what preserves and seals the bottles properly. After the water has gone cold, the bottles can be pulled out and put away. We try to make enough to last us a whole year, so we put them into crates, keep one crate in the kitchen and store the rest of them in a cool place. When you want to use the sauce, it still needs to be cooked, so you can experiment with different recipes at the time - you can add your herbs, spices, wine, etc. and let it cook for anywhere between half an hour and two hours. Now you know exactly what goes into your sauce, no preservatives and in my opinion, it tastes so much better than the ready made sauces from the shops that you’ll never want to buy that stuff again!